"Hell For Stout" Shocks are Here! 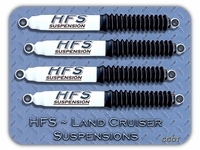 HFS™ Shocks are specifically formulated for early model Land Cruisers and their unique suspension dynamics. HFS™ shocks are designed to work as a system with HFS™ Lift Springs and BDS Lift Springs. 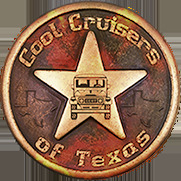 Position & Install Decals after installation. 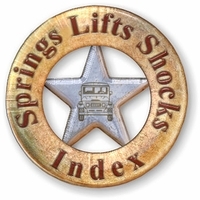 NOTE: Shocks are ideal for FJ40s with 2" to 2.5" Lift Springs. These shocks are too long for Stock Springs. These shocks are too long for Stock Springs even when fitted with 1.5" or 2.5" Lift Shackles. NOTE: Shocks are ideal for FJ60s with 2" to 2.5" Lift Springs. These shocks are too long for Stock Springs. These shocks are too long for Stock Springs even when fitted with 1.5" or 2.5" Lift Shackles.